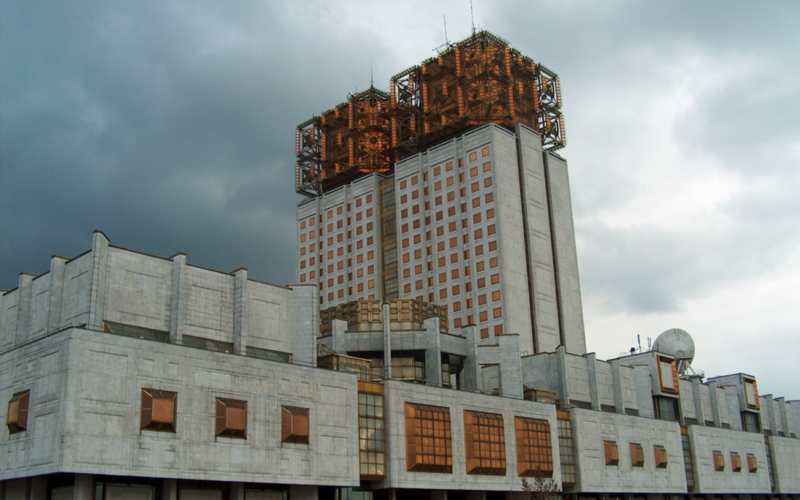 The story is more than likely an urban legend but the building is real enough – standing proudly in Moscow since the nineteen nineties. It’s a part of the Russian Academy of Science. The building looks as though it was created in the nineteen sixties and indeed, that’s when the idea of erecting an academy of science was first mooted, yet construction started in the mid-seventies yet didn’t become finalised until the nineties. And thereby hangs a spooky story. The building (or buildings plural – it consists of two towers) looks striking, with its seemingly jumbled and unique uppermost structures. Much of the building’s external decorations are reflective so that the building changes as the sun moves around it and the weather changes. See the quick time-lapse video below. And that’s why the urban legend developed. Are those flashes and reflections really random? Are they there for a reason or do they serve no purpose other than decoration and interest? When the building was completed a member of staff who worked there reported that his colleagues working within the building started to suffer from mysterious headaches. This was then developed into the theory that the reflections and seeming gyrations of the metal structures atop the building had a very serious purpose indeed. It was theorised that they were actually transmitted information to the people who worked in the building – and those who visited it and lived and worked in the immediate area – and that they were slowly being brainwashed.